Even though I speak not one word of Russian, I sang in the Yale Russian Chorus for two years just because I loved the music so much (it was quite a task memorizing all the words). This piece, Blagoslovi, dushe moya or "Praise the Lord", by Rachmaninoff, was part of our sacred repertory. Try playing this in the background as you read and pray. Now Abram was very rich in livestock, in silver, and in gold. 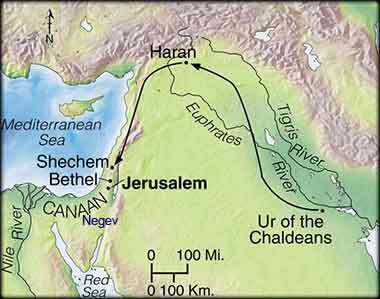 And he journeyed on from the Negeb as far as Bethel to the place where his tent had been at the beginning, between Bethel and Ai, to the place where he had made an altar at the first. And there Abram called upon the name of the Lord. And Lot, who went with Abram, also had flocks and herds and tents, so that the land could not support both of them dwelling together; for their possessions were so great that they could not dwell together, and there was strife between the herdsmen of Abram's livestock and the herdsmen of Lot's livestock. At that time the Canaanites and the Perizzites were dwelling in the land. Having survived the famine and all the risks attendant with living in Egypt, Abraham and his nephew Lot return to the place where they had made home after they left Ur of the Chaldeans. They both must have been excellent husbandmen, because they returned with great wealth. And again, the Bible mentions that Abram speaks the "name of the Lord", an act that had enormous significance at the time. We again see indications of how early Abram lived. Although there are tribes in the area, the land has not yet been fully populated; Abram and Lot simply arrive and claim a large chunk of pasturage, without any apparent conflict. In fact, the only conflict mentioned about land is between the two of them! The people called Canaanites were simply an early people who were living in the area at the rise of the bronze age; although their existence is well-established and archaeologists have found a number of sites with cultural similarities, and mentions of them were preserved in Egypt, little is known about their language, religion, etc., as they had no writing. On the other hand, the Bible is the only record of the "Perizzites". Almost certainly, they were one of hundreds of wandering pastoral tribes in a time when the earth had few people and almost no borders. They left no identifiable artifacts.